The scenic beauty of these waterfalls is opulent; its everlasting scenery makes all these places favorite of photography lovers and nature enthusiasts. So, the tourist is a nature lover then they should make their way to these cascades. Waterfalls of Madhya Pradesh are in full swing during the monsoon season as the heavy downpour fills the waterfalls to the brim. Diversity is synonymous to Madhya Pradesh; the dynamic state is a surreal land that has captivated the hearts of many tourists. North, South, East, West, Madhya Pradesh has a sizeable number of waterfalls. One of the most among them all is the Dhuandhar. The water curves show it unique faces in different seasons. During the months of monsoon, the water rapids turn ferocious while in summer, the look is different as one can see beautiful crevasses the water has carved into the limestone. 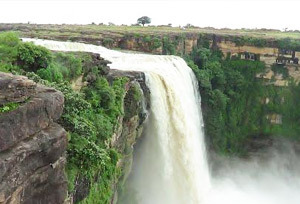 Keoti Falls in Rewa district is yet another charming white water shower that Madhya Pradesh has in its kitty. The formation waterfall is evoking and spellbinding. 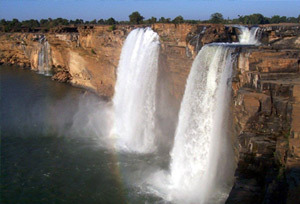 Bahuti is the largest waterfall in Madhya Pradesh. What makes this cascade special is not its length but its surroundings beauty that is spectacular to experience. See below for the list of waterfalls that can be seen on holiday in Madhya Pradesh. On a next holiday to Madhya Pradesh, do visit Madhya Pradesh waterfalls, especially in monsoon when nature is evergreen as always and water rapids are vehement.